Shining almost directly overhead as darkness falls these days is the brilliant bluish-white star Vega, in the constellation of Lyra, the Harp. 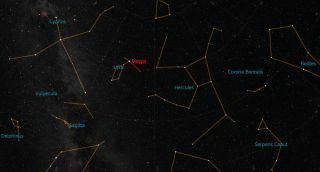 Vega is the fifth-brightest star in the night sky, and the third-brightest visible from midnorthern latitudes, trailing just Sirius and Arcturus. Also, as seen from midnorthern latitudes such as New York or Madrid, Vega goes below the horizon for only about seven hours a day, meaning you can see it on any night of the year. Vega is located 25 light-years away, has a diameter approximately three times that of our sun and is 58 times more luminous. In January 2002, astronomers at the Harvard-Smithsonian Center for Astrophysics announced that features observed in a cloud of dust swirling around Vega may be the signatures of an unseen exoplanet in an eccentric orbit around the star. And observations of Vega in 1983 with the Infrared Astronomy Satellite provided the first evidence for large dust particles around another star, probably debris related to the formation of planets. This discovery likely inspired Carl Saganto place a planetorbiting Vega in his famous novel "Contact." Vega also was the first star ever to be photographed. The historic photograph was made using the daguerreotype process at Harvard Observatory overnight on July 16-17, 1850. A 15-inch refractor was used, but nonetheless it still took an exposure of 100 seconds for Vega’s image to register. Vega's constellation, Lyra, was supposed to represent Apollo’s harp. Officially, Lyra is a lyre — a stringed instrument of the harp family used to accompany a singer or reader of poetry, especially in ancient Greece. Six stars form a combined geometric pattern of a parallelogram and an equal-sided triangle attached at its northern corner. Vega gleams at the western point of the triangle. But there are other interesting sights to explore here as well. Epsilon Lyrae, at the northern point of the little triangle where Vega is located, is known as the "double-double" star. Those with good eyesight discover that Epsilon is really a close pair of stars. Binoculars readily separate the two, while a moderately large telescope shows each one divided again into two stars. The star Sheliak is one of the two that forms the southern side of the parallelogram; it appears to diminish by half its normal brightness about every 13 days when it’s eclipsed by a darker companion star. Between this winking star and its neighbor, Sulafat, is the famous Ring Nebula, faintly glowing like a ghostly doughnut or a cosmic smoke ring. Visible only in large telescopes, the nebula appears as an oval ring around a star. Millions of years ago, this star exploded, hurling out great masses of gas. We see the star now through the thin part of this gaseous envelope. Editor's note: If you capture an amazing photo of any night sky sight and would like to share it with Space.com for a potential story or image gallery, send images and comments in to managing editor Tariq Malik at: spacephotos@space.com.